Amphibole is widely employed to calculate crystallization temperature and pressure, although its potential as a geobarometer has always been debated. Recently, Ridolfi et al. (Contrib Mineral Petrol 160:45–66, 2010) and Ridolfi and Renzulli (Contrib Mineral Petrol 163:877–895, 2012) have presented calibrations for calculating temperature, pressure, fO2, melt H2O, and melt major and minor oxide composition from amphibole with a large compositional range. Using their calibrations, we have (i) calculated crystallization conditions for amphibole from eleven published experimental studies to examine the problems and the potential of the new calibrations; and (ii) calculated crystallization conditions for amphibole from basaltic–andesitic pyroclasts erupted during the paroxysmal 2010 eruption of Mount Merapi in Java, Indonesia, to infer pre-eruptive conditions. Our comparison of experimental and calculated values shows that calculated crystallization temperatures are reasonable estimates. Calculated fO2 and melt SiO2 content yields potentially useful estimates at moderately reduced to moderately oxidized conditions and intermediate to felsic melt compositions. However, calculated crystallization pressure and melt H2O content are untenable estimates that largely reflect compositional variation in the crystallizing magmas and crystallization temperature and not the calculated parameters. Amphibole from Merapi’s pyroclasts yields calculated conditions of ~200–800 MPa, ~900–1,050 °C, ~NNO + 0.3–NNO + 1.1, ~3.7–7.2 wt% melt H2O, and ~58–71 wt% melt SiO2. 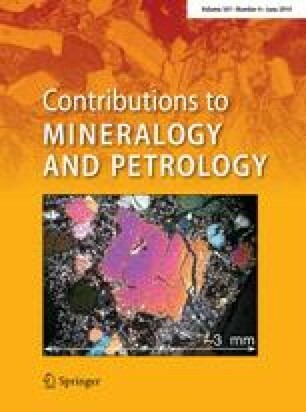 We interpret the variations in calculated temperature, fO2, and melt SiO2 content as reasonable estimates, but conclude that the large calculated pressure variation for amphibole from Merapi and many other arc volcanoes is evidence for thorough mixing of mafic to felsic magmas and not necessarily evidence for crystallization over a large depth range. In contrast, bimodal pressure estimates obtained for other arc magmas reflect amphibole crystallization from mafic and more evolved magmas, respectively, and should not necessarily be taken as evidence for crystallization in two reservoirs at variable depth. The online version of this article (doi: 10.1007/s00410-014-1016-4) contains supplementary material, which is available to authorized users. This research was funded by the French Ministry of Scientific Researches, ANR-Blanc DOMERAPI to J.-P. Métaxian and co-workers. We thank J.-C. Komoroswki for invaluable guidance in the field and for stratigraphic explanations. C. Noer, L. Arbaret, and A. Burgisser are thanked for interesting discussions during the field mission. J.-L. Bourdier is thanked for sharing his knowledge on Merapi’s eruption dynamics. I. Di Carlo provided much assistance with SEM imaging and microprobe analyses and shared many thoughts on amphibole textures and composition. Reviews by O. Bachmann, F. Ridolfi, and P. Shane, and J. Hoefs’ editorial assistance are greatly appreciated.